In the early 70s, John & Marian Hindmarsh donated over seven acres of land on Black’s Point Road near Goderich to the local Girl Guides to use as a camp. They deeded it to the local Girl Guides for $1.00! 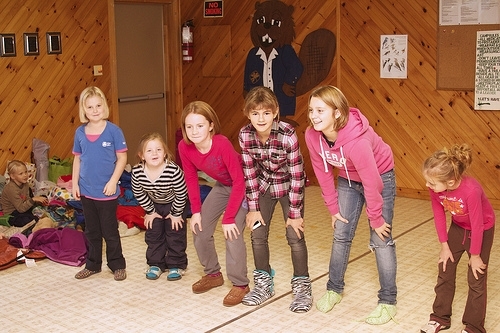 The local Girl Guides ran Camp Klahanie successfully for the next 35+ years. Through fund raisers, local donations from the community and frugality, they managed to keep the camp in the black without any financial assistance from the upper levels of Guiding. During those years, the Goderich Lions Club provided support through building a kitchen and meeting hall and providing fill to raise the land above the wet ground table. The Goderich Lions provided over $75,000 in capital improvements and ‘sweat equity’! In 2009, the Provincial level of Girl Guides declared that Camp Klahanie was no longer viable and closed the camp without warning. They then announced that they would sell the property to the highest bidder and use the returns to fund other activities. In 2010, the Goderich Lions Club began a three-year project to recover the camp and return it to the local community as a Youth Camp, available to ALL youth groups in Huron County! Finally, as of July 31st, 2013, the Goderich Lions Club purchased the camp from the Girl Guides of Canada for $110,000.00. Camp Klahanie is a not-for-profit, destination camp for children and youth organizations to foster environmental awareness and the stewardship of nature. It is a welcoming space for use by children and youth oriented organizations, educators, service clubs, churches, family and community groups to encourage fun and fellowship in the outdoors. Camp Klahanie is located at 33620 Black’s Point Road in Central Huron, ON. Safe Guide Emergency Plan is available. The camp is less than a 10 minute drive to Goderich and Emergency Response times are under 30 minutes.